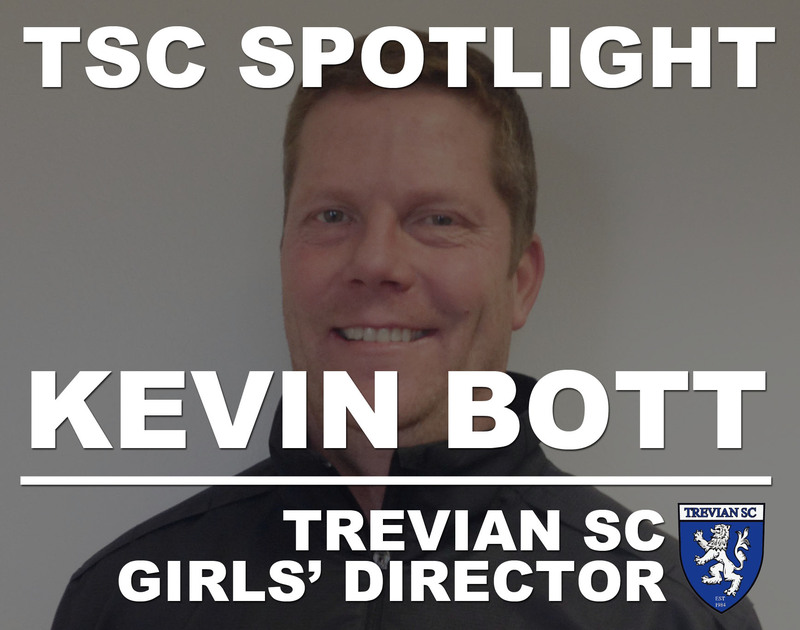 "There is nothing more satisfying than being a positive influence in the life of a child," says Kevin Bott, Trevian Soccer Club Girls' Director. "Always walk off the field, whether it be a game or a practice, feeling good about the effort you put forth." "Respect, kindness, being courteous...is what I tell my players all the time. Treat everyone with the same respect, kindness, and courteousness if you want to be respected." Keep reading to learn more about Kevin's coaching philosophy as it relates to player development, coach development and community. We've asked Kevin 14 questions that will show you what a positive influence soccer can have on your child both on and off the field. Trevian Soccer Club is a 7 - 11 year old boys and girls soccer program (affiliate of FC United Soccer Club) that originated as a small local club and is now one of the largest local clubs in the Midwest that still sticks to its original roots. TSC looks to strengthen young people through a competitive and positive atmosphere that breeds proper technique, ball movement, relationships, teamwork, respect, and discipline. Coach Bott has made a huge impact in our club for the last 12 years. Kevin has been on the field coaching since 1989 and joined our Trevian SC coaching staff in 2005. We feel that each child is lucky to be exposed to Kevin's style of coaching and positive influence both on and off the field. Get to know Kevin like we do. FCU - Why are you excited to be part of the Trevian SC / FC United family? KB - The club has worked tirelessly to put together a staff that is second to none on the field, and equally important, a staff of good people. FCU - What is your coaching philosophy? KB - In working with the youngest players, 7 - 11 years old, it is important for me to keep everything full of energy and to make it fun and competitive for each and every player. This may be the first club experience for many of these players and a priority of mine is to make sure they leave feeling like they are part of the family. FCU - How do you motivate your players to learn and play to the extent of their ability? KB - Young players feed off of others. I always try to come to each and every session and game with energy. Attitudes are contagious, if I am engaged and fully invested exerting a lot of energy then the players will feed off of that. FCU - How do you create a training environment that allows for enthusiasm, creativity, and self confidence? KB - I do my best to create a fun, energetic, and educational environment where players are encouraged to get out of their comfort zone. I tell players that it is ok to make mistakes and that mistakes will continue to happen until the day we die. We need to focus on learning and not repeat the same mistakes each week. FCU - What unique ability does your role give you? KB - The role of a coach gives me the ability to be a positive influence in the life and development of a child. FCU - What is the best advice you have ever received? KB - People give us advice all the time. It's what we do with it that makes it good or bad. The best advice I have ever received will always be from my parents, "do your best and make good choices in life." FCU - What was your very first job? FCU - What is something people may not know about you? KB - I am a skilled tradesman and I used to build homes for a living. Also, I enjoy camping with my family and going for rides on my Harley when I can. FCU - What achievement are you most proud of in your life? KB - My four children, Grace, Charlie, Henry, and Will. FCU - What meal could you not live without? KB - As my kids grow older and schedules get busier, any meal that I can eat with them is all I need. FCU - Who is your favorite professional sports team? FCU - Favorite musical artist? KB - "Hard work beats talent when talent doesn't work." FCU - One word that describes you.